Ice sculpture; a character “寿” is curved. 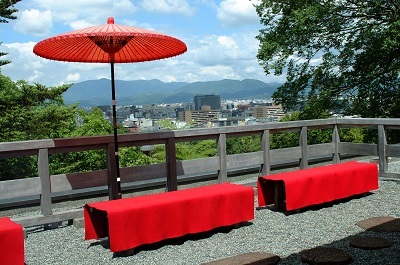 The wedding ceremony and the reception were taken place at “Kacho-Momoyama” where you could have a full view of Kyoto. 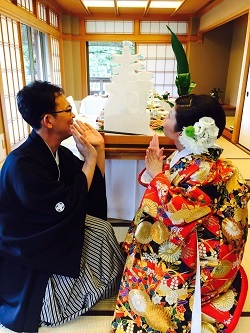 One of our client couples had a civil wedding and a reception at “Saami (ryoutei restaurant)” recently. It was a warm wedding ceremony consists of various programs such as a “Wedding Tree” which all the family members participated in, and “Mizuawase-no-gi” for which both families brought a bottle of “sake” from the region. They once again confirmed the strong family ties. At the reception, the head chef presented an ice sculpture with the letter “寿” (=auspicious) curved on the surface and all the guests admired it. The voice, laughter, expressions and tears were full of joy and cerebrating mood. We are so grateful that we could serve for such a wonderful wedding.